South Korean President Park Geun-Hye bowed during an address to the nation amid increasing calls for her resignation over a corruption scandal engulfing her presidency. Prime Minister Hwang Kyo-ahn, South Korea’s acting leader, says he feels ‘‘deep responsibility’’ over the political scandal that brought down his boss, President Park Geun-hye, because he assisted her as the country’s No. 2 official. ‘‘I'd like to say I'm sincerely sorry to the people,’’ Hwang said. Hwang urged ruling and opposition parties to cooperate in the wake of Park’s impeachment. South Korean lawmakers vote to impeach President Park Geun-hye, a stunning fall for country’s first female president. Hwang also urged ruling and opposition parties to cooperate to bring back stability. Hwang will be acting president until the country’s Constitutional Court deliberates on whether to formally end Park’s presidency or reinstate her. The court has up to 180 days. South Korean President Park Geun-hye has been officially stripped of power after being impeached. The suspension of Park’s power was made Friday when her office received a copy of the impeachment motion hand-delivered by National Assembly officials. Prime Minister Hwang Kyo-ahn now steps in as acting president until the country’s Constitutional Court deliberates on whether to formally end her presidency or reinstate her. The court has up to 180 days. Aides say President Park Geun-hye has replaced one of her advisers just before she was impeached. Friday’s reshuffle will be Park’s last if the Constitutional Court makes a decision to formally end her presidency. During court deliberations that can take up to 180 days, Park’s presidential powers including those related to personnel appointments are suspended. 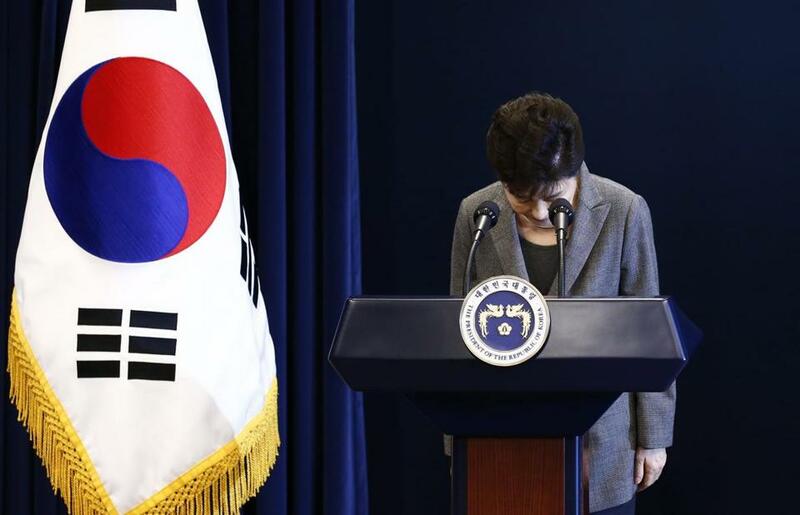 Park’s office says she accepted the resignation by Choi Jai-kyeong, presidential secretary for civil affairs, and named lawyer Cho Dae-hwan to replace him. Prime Minister Hwang Kyo-ahn, who will assume President Park Geun-hye’s duties following her impeachment, has instructed Defense Minister Han Min Koo to keep a close watch on North Korea and prepare for any crisis. Hwang’s office said Friday he also called Foreign Minister Yun Byung-se and raised the need to maintain close cooperation with the international community in implementing sanctions against the North over its nuclear weapons and missiles program. Hwang’s office says he asked Yun to provide explanations to other countries that there will be no major changes to Seoul’s foreign policy. Hwang’s office says he was planning to chair an emergency Cabinet meeting and also a National Security Council meeting later on Friday. Seoul’s Unification Ministry, which handles affairs related to rival North Korea, says the government will maintain ‘‘without disruption’’ its policies toward the North following President Park Geun-hye’s impeachment. The ministry says the government will maintain a close watch on North Korea following the vote. Earlier Friday, South Korea’s defense minister ordered heightened military readiness to brace for any possible provocation by North Korea, although no suspicious activities have been observed. Impeached South Korean President Park Geun-hye is apologizing to the nation for ‘‘negligence’’ in a scandal that led to her fall. Park said Friday at a meeting of her Cabinet that she takes seriously the parliament’s actions to impeach her and the voices of the people who’ve been protesting her over a corruption scandal. She says she would prepare for a court review of the impeachment. Her comments come ahead of a hand-over of power to her prime minister. Chief Cabinet Secretary Yoshihide Suga says Japan is closely watching developments surrounding the impeachment of South Korea’s president. Suga says South Korea is Japan’s most important neighbor that shares a strategic relationship, especially when it comes to North Korea. He says there will be no change in Japan’s policy toward South Korea. President Park Geun-hye was impeachment earlier Friday following a scandal in which she allegedly let her close friend manipulate government affairs. South Korea’s prime minister and acting president will address the nation following President Park Geun-hye’s impeachment. Hwang Kyo-ahn’s office says he will make a speech at 8 p.m. It gave no further details but media reports say Hwang’s speech is aimed at easing possible public worries about state affairs following Park’s impeachment. Hwang will serve as acting president while Park’s power is suspended until the Constitutional Court determines whether to formally unseat her or reinstate her. South Korea’s defense minister on Friday ordered heightened military readiness to brace for any possible provocation by North Korea after the South’s President Park Geun-hye was impeached by lawmakers. The order was made after Prime Minister Hwang Kyo-ahn called Defense Minister Han Min Koo and said the military must be ready to deal with any possible act by North Korea, Han’s ministry said in a statement. Hwang will serve as acting president while Park is stripped of her presidential power until the Constitutional Court determines whether to formally unseat her. The Defense Ministry said there were no suspicious activities by North Korea. South Korean President Park Geun-hye is to meet with her Cabinet after parliament passed a motion to impeach her. Park’s office says the meeting is set for 5 p.m. at the presidential Blue House. Among the Cabinet members Park will meet is Prime Minister Hwang Kyo-ahn, who will serve as acting president while Park’s presidential powers are suspended until the Constitutional Court makes a ruling on whether to end her presidency. Park has not commented publicly on the impeachment vote. South Korean National Assembly speaker Chung Sye-kyun said the bill on President Park Geun-hye’s impeachment was passed by a vote of 234 for and 56 opposed, with nine invalid votes and abstentions. That well surpassed the necessary two-thirds support in the 300-seat assembly. The opposition needed help from members of Park’s party to get the needed votes, and it got it. South Korean lawmakers voted to impeach President Park Geun-hye, a stunning fall for country’s first female president after a corruption scandal that left her isolated and loathed. As they voted hundreds of protesters massed in front of the National Assembly building. 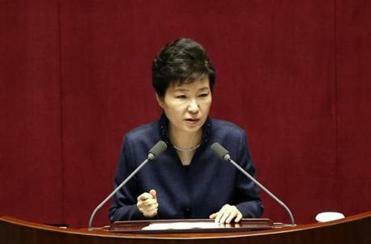 South Korean lawmakers began an impeachment vote Friday against President Park Geun-hye. Success is widely expected amid a corruption scandal that has left her isolated and loathed. As hundreds of protesters massed in front of the National Assembly building, lawmakers inside lined up to enter curtained voting rooms, where they recorded their anonymous votes and then emerged and put their folded ballots in boxes. Ahead of a vote to impeach South Korean President Park Geun-hye, opposition members of parliament sat on the floor and chanted ‘‘Impeach’’ with raised fists. They’re confident that they’ll get what they want Friday, the last day of the current parliamentary session, because dozens of members of Park’s ruling party have said they’ll vote against the woman who was once their standard bearer.